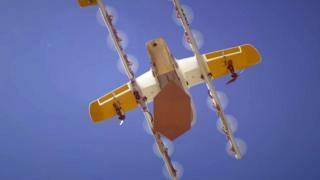 Wing, owned by Google's parent company Alphabet, will deliver takeaway food, coffee and medicines by drone to about 100 homes in Canberra. Wing's drones deliver small packages which are lowered into the customer's garden on a length of string. The Bonython Against Drones campaign said the devices could be heard from "a long way off, both coming and leaving".